Cossack troops today are a separate branch of Russia's Armed Forces. A new chapter in the history of the Russian Cossacks began when President Boris Yeltsin set up the Main Directorate of Cossack Troops, as part of the Cossack revival in Russia, on January 23, 1996. As Russia's modern Cossack troops mark 20 years of maintaining order, we look at what they do, whom they answer to, and how they are armed. The Cossacks first appeared in the 15th century and were, over time, co-opted by the state. In Europe, people still talk about the Cossack forces who took Berlin and Paris. There was no war in which the Cossack troops would not take part. However, the system of Cossack self-government was abolished from 1920 by a decree of the Council of People's Commissars. The rebirth of the Cossack communities began in 1989, just before the collapse of the Soviet Union. Since then, roughly 30 Cossack hosts, united under the Russian Union of Cossacks, have been revived or newly created in Russia and its neighboring countries. They are led by the Supreme Ataman of the Russian Union of Cossacks. 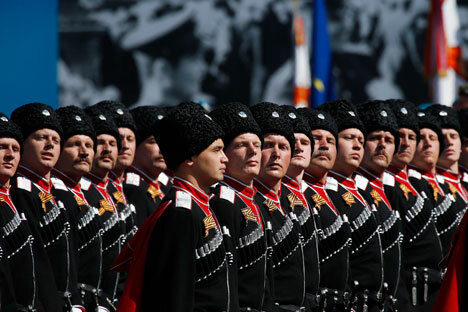 Cossack troops today are a separate branch of Russia's Armed Forces. They answer to the Supreme Commander-in-Chief of the Russian Federation. Military administration of the Cossack troops is the job of the Main Directorate of Cossack Troops, headed by a Cossack general, under the Russian Ministry of Defence. The military districts have military district directorates of Cossack troops, whose job it is to administer and train units and keep a record of the Cossacks; both those doing military service and those living in the district. Russia's leaders are doing everything to give the Cossacks greater social significance in Russian society. To this end, the Cossacks take part in combat and peacetime missions. As it happens, the latter are most popular with the public, as the Cossack troops are a relatively young institution and, unlike the police, have not been involved in corruption and scandals. In peacetime, the Cossacks' job is to guard and protect Russians, as well as the interests of the state in various areas, from protecting state property to forest protection. In wartime, the Cossack troops become genuine military units, capable of carrying out military actions and dealing with the same challenges as other Russian troops. If in the early 20th century the Cossack troops made up the backbone of the cavalry, today the main tactical unit of the Cossack troops is a motorized brigade that includes four Cossack regiments. The brigade includes an artillery battalion (2A65 Msta-B 152-mm towed howitzers – 9K59 Prima 122-mm multiple rocket launchers), an anti-tank artillery battalion (9K133 Kornet-E anti-tank missile systems – 2A45 125-mm Sprut-B anti-tank guns), and an anti-aircraft battalion (Pantsir-SMK anti-aircraft missile systems), with all-terrain vehicles (9K338 Igla-S portable anti-aircraft missile systems) and support units. Cossack troops are also in the plastoon (mountain) brigade, which undertakes military activities in mountainous areas and is also well provided with modern military equipment: light armored vehicles (LAVs), 120-mm self-propelled guns, 9K114 Shturm-S self-propelled anti-tank missile systems, 9K35M4 Strela-10M4 anti-aircraft missile systems or MT-LBM 6M1B5 anti-aircraft gun and missile systems). The plastoon brigade comprises four plastoon squadrons with lightly armored military vehicles, with various categories of troops (a Cossack artillery battalion (2A61 Pat-B 152-mm towed howitzers – 9K59 Prima 122-mm multiple rocket launchers), a Cossack anti-tank battery (9K114 Shturm-S self-propelled anti-tank missile systems), a Cossack anti-aircraft battalion (Strela-10M4 anti-aircraft missile systems – 9K338 Igla-S portable anti-aircraft missile systems) and support units. The Russian Union of Cossacks today comprises around one and a half million people in all its military organizations.